As a college freshman, I said yes to almost everything that came my way. Invitations for dance workshops, dinners with directors of majors I had no intention of majoring in, volunteer opportunities that were WAY off campus, you name it. Because I said yes, I found that I was constantly running from activity to activity. After a while, I was no longer having fun. Sometimes we accept requests because we don’t want to appear rude by saying no. We refuse our own happiness and priorities for those of others to avoid conflict whether now or later. We think that if we say no it means that we will miss out on a golden opportunity to meet people or network. When I have this fear, I remember back to John Maxwell’s quote about saying no to the good so I can say yes to the best. Procrastination can be described in a hundred different ways, but the central idea of procrastination is delaying a high-priority task in favor of a lower one. If I put off doing my tax returns to play my Wii, I am procrastinating; but if I choose to do my tax returns instead of playing my Wii, I am not procrastinating because playing the Wii is a lower-priority to me. Procrastination can exist because of many reasons. These reasons appear in different ways and as such, you won’t always procrastinate for the same reason. For example, sometimes you are stressed out by your to-do list and procrastination gives you a temporary escape. Other times, a more fun, but low-priority alternative is more attractive to you. Procrastination management is an art and not something that happens in a short time, but it is a skill that can be learned. In this article, I will address some of the most common causes of procrastination and the ways you can overcome these to minimize or even eliminate procrastination. I found that during my second semester at Yale, I was taking 5.5 credits (24 Credit Hours) and was extremely involved in six of my extracurricular organizations. I was constantly being pushed from one event to another. Even though I didn’t procrastinate on my homework or meetings, I found that I didn’t have as much fun as I did first semester when I only took 4.5 credits. Last semester I took 4.5 credits with five extracurricular and never felt happier to be at Yale. I found the right balance that allowed me to take one task at a time and never feel rushed. I have time for two-hour dinners, to watch TV, and play some poker. Even as you learn to overcome procrastination, remember that it is okay to enjoy yourself once in a while. Play another round of 18 or load up another Just Dance 4 track. Less is more. Other times, I might be stressed because I don’t know how to begin or what I am doing. In these cases, I break down what I want to do, what I don’t know, and how I will figure out the skills needed or figuring out how to get the job done. In these situations, I just ask for help. Sometimes we procrastinate because we are tired or just want to be lazy. Maybe we had a long day or didn’t get enough sleep. The lazy bug is contagious and once we begin to watch one movie or play one hour of League of Legends, the next thing we know is that our entire day is gone. The solution to the lazy bug induced procrastination is using Newton’s First Law of Motion: an object at rest stays at rest and an object in motion stays in motion. Start doing something to get yourself moving and working. When you feel lazy, do something that won’t drain you completely, but will contribute to your greater project. Sometimes, you have the will-power, but not the time. In these instances, you need to apply a lot of your self-discipline to find time and work through tasks you might not enjoy for a result that you want (ex. An “A” in the class). If your self-discipline is lacking, procrastination becomes a tempting mistress. To overcome this, remind yourself of the benefits from doing the task and start small until you have built enough momentum to continue with the larger tasks. Other times, you procrastinate because you have no choice. You are always working from one task to another. I talk about this in one of my favorite posts. Developing better time management habits to help you overcome procrastination due to “not having enough time” involves identifying your current problem, time wasters, and figuring solutions for these time wasters. I talk about time management at the end of last year. You can find solutions to common bad time management habits here. I would love to hear your opinions about procrastination. What causes your procrastination? How do you overcome it? Yesterday, I gave you a major update on my future plans for Find My Motivation. Over the next few months, I will be working to improve Find My Motivation’s site, content, and resources. I plan to have a relaunch around the summer of 2013. I will post some of my updates here on Find My Motivation. If you are interested in the new site, sign-up for exclusive updates only available through email. I will be working on the updates and supporting the current blog. Until the next update, keep motivated and sign up for the exclusive updates. Tomorrow’s article will be about procrastination and how to overcome it. I wanted to give you some major updates for Find My Motivation. Over the last few weeks, I have been thinking of ways to improve Find My Motivation. In the next few months, I plan to relaunch Find My Motivation with an improved website, better articles, and more resources to help you achieve your goals. But I need your help. Have Suggestions for the relaunch of Find My Motivation? Click the link below. I will have another update tomorrow and on Tuesday I will have a new article on procrastination and on how to overcome it. I wanted to share this Ted Talk about following through with your New Years Resolutions. More specifically, I want you to pay attention to the power of sharing your goals and even creating a blog to let friends and family track your progress and support you. 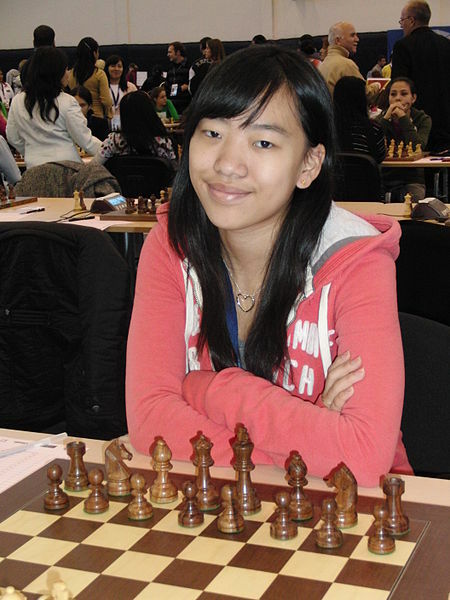 Today’s Featured Writer is Yuanling Yuan, an International Chess Master, the founder of the Chess in the Library program, a member of Berkeley College at Yale, and a dear friend. Yuanling will talk about the importance of persistence. A spasmodic coughing sound drew the attention of six hundred serious looking adults who enjoyed the silent peacefulness and the concurrent tik-tok, tik-tok that came from the analog chess clocks. Every once in a while, these chess players frowned and stole a glance at the source of the disruptive noise, which came from a little girl in pink. With her hair tied in pigtails and her feet dangling way above the ground, she seemed to be in elementary school at most. However, what caught peoples’ eye was not the girl’s youthfulness but rather this small wet towel that she held up to her forehead at all times. Her other free hand pushed the piece on the chessboard with great effort as her whole body trembled underneath the many extra layers of clothing. Her face was pale white and her eyelids were trying their best to stay open. Everyone at the tournament site looked at the girl in disbelief. Why is she still playing? Why is she doing this to herself? Eight years ago, that little girl was me. In December 2003, my mother and I took the Greyhound to Las Vegas to play in the 13th Annual North American Open in Las Vegas. Unfortunately, before we even arrived at our destination, I was hit by a high fever and a sore throat. After I threw up all over the bus, the driver nearly threw me out of the window as well. By the time we arrived at our hotel, it was past midnight and my condition was only becoming worse. My mother asked me tenderly, “Yuanling, let’s go home. Let’s withdraw from the tournament.” I had hardly any energy left but I looked at her in the eye and shook my head slowly: “We have come a long way, mom. I can play.” Knowing my stubborn tenacity, my mother nodded without saying another word. Deep down, I was aware that my parents had spent a great deal of money, time and effort to send me to a large-scaled event like this one so I was determined to make the most out of it, whether sick or not. I trained thirty-five hours a week for this moment – how could I let my physical strength be an excuse to flee from this battle of the mind? I was so passionate about chess that I did not care where, when or how I was playing the game, as long as I was able to manipulate those shiny plastic pieces into a checkmate position. Chess meant much more to me than just a game. It was a medium through which I discovered the most about who I am – a girl who is never, ever, willing to give up. Thus, I played each of the six games in the tournament with a wet towel on my forehead and a cup of hot chocolate by my side. I did not budge when one of my opponents encouraged me to resign and quit the tournament – I considered it as a clever tactic in attempt to get an easy win. To everyone’s surprise, I won four games and drew one, finishing fourth in my section of over a hundred people. Perhaps this is simply one example of how my stubborn determination ultimately prevailed but it is the most memorable one. Ever since then, the image of myself in that pose – one hand on the towel and another on the board, encourages me to overcome any challenge that crosses my path to success. I remind myself: “Yuanling, if you can do that at nine with the whole world against you, what is there that you cannot do?” More importantly, had it not been for my persistence, I would have not become the youngest Women International Master in Canada at the age of fifteen. You can read more about Yuanling here. One of the most common questions I get asked is, “what separates successful people and those who fail to reach their goals.” Is it money? Is it education? Is it luck? For a while I pondered on this question as well. I ran through all the reasons why someone would succeed, but also tried to give myself examples where this is not necessary. Money can open up many doors and allow you to try and pick yourself up when you fall, but money wouldn’t explain why people without resources also succeed and that resourceful people have access to the same opportunities as those with plenty of money. Education wouldn’t explain why many CEOs and business owners attended “non-brand name” schools; some didn’t even have college training at all. And with luck, you could have all the luck and opportunity available but if you don’t know how to take advantage of them it is as if the opportunities never existed. I find that the most important quality in achieving your goals does not have to do with smarts, riches, or luck, though those can have a positive effect. The quality that separates people who accomplish their dreams and those who don’t is determination. Having determination keeps you going to the gym every day when you would rather sleep in. Having determination allows you to pick yourself up when your business fails. Having determination helps you to be resourceful if you are not rich or if the opportunity is not obvious. But like the muscles in your body, your determination will only grow if you exercise it. The people I admire for their determination at some point all fell down, failed at their dreams, and had to pull themselves back up. Make 2013 your year to exercise your determination muscle. Tomorrow ‘s Featured Writer is Yuanling Yuan, an International Chess Master, the founder of the Chess in the Library program, a member of Berkeley College at Yale, and a dear friend of mine. Yuanling will talk about the importance of persistence. Come back tomorrow for Yuanling’s article. As you begin the New Year with goals and resolutions. It might seem that you have plenty of time to complete them and the illusion of endless time might give you an excuse to push your goals further away. Even with 365 days or 8760 hours to complete your resolutions, I want you to think differently this year ,to value each second, minute, hour, day, week, and month as if you might not get another. I wanted to share with you one of my favorite poems about the value of time. Ask the person who has missed the train, bus or plane. Time is precious, make the most of it. I cannot believe that 2012 is over. It seem only like just yesterday when I wrote down my resolutions for 2012 and now I am one year removed from that day. I am amazed at what a difference a year has made in my life. In 2012, I had a few resolutions that I wanted to accomplish and for the first time in many years I have been able to say I have accomplish most of my goals. I just wanted to demonstrate what a difference a year can make if you are persistent. Here are two of goals from 2012. Improve my Poker (Hold’ em) Skills. A year ago, I remember playing my first poker game with my family (a full 9 person ring) during Christmas. Needless to say, I was destroyed by my family. I lost buy-in after buy-in. After I left with an empty wallet, I promised to improve my game. I made a 2012 resolution to be able to beat my family during X-Mas 2012. From January to December, I read about a dozen books and articles on poker theory, watched videos of my favorite players, and started playing poker every week at Yale and at home. Last week I tested my progress; I walked away from our annual family game with 5 times what I entered with. The next morning Tina and I played with her family where I left with 3 times my entry. In both games, I was no longer the table fish, I had become the shark. There are still holes in my game that I plan to improve in 2013. I started the year being able to do 30 push-ups and 5 pull-ups. I ended 2012 with 350 and 40. While those numbers are a big change, I still have room to grow. But as with everything it all started with the first work-out and a little support from friends. Today is New Years, a day to begin anew. If you did not accomplish everything you wanted in 2012, made mistakes in 2012, or even misused your opportunities, then 2013 is a chance to do what you could have done. It all begins with the first workout or the first practice poker game. It took me over six years to begin to lose weight, but had I not started in 2012, today is another day I could have started. Grab your New Year’s Resolutions and let 2013 be the year you finally cross items off your list. Remember that it is never to late to be who you could have been.